Puja is a great opening statement of what this album has in store for you. It’s got massive orchestral moments, ethnic treats, a soaring vocalise from Sam in the middle, very live yet very electronic, places where it feels spiritual, almost ceremonial, it’s hugely celebratory but passionately emotive. And it’s a funky dance number! Prchla is the Macedonian word for peacock and is used as a reasonably affectionate term for a show-off. This is a blatant show-off track particularly for Pierre, Jon and some awesome gypsy fiddle from Kait, over the top of a mad drum and bass groove and a multi-vocal Balkan-esque chorus. Hindi for Sun - this was co-written with and features the beautiful, and very spiritual, voice of Nalini, who we were luckily enough to have guest with us on a couple of occasions in 2006. It was known as ‘Lemar’s One’ for year’s after Myo’s grandson are always used to go mental and grab the mike and sing along when she practised it at home! One of 2 tracks on this album which we played at our first gig but which has spent years changing and growing along with the band, from a track that was almost an onstage jam to a funky, tightly produced number – again, very electronic yet very live. 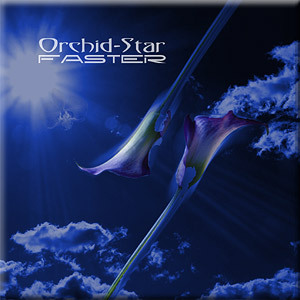 The first track actually written for Orchid-Star, and the result of Becky saying ‘write me something hard’. I did that, for both her and Kait, but also, it turned out, for myself. At the end where, after a violin solo and a mad marimba solo, it looks like it’s the Pierre’s turn but Kait and Becky simultaneously reprise their parts was one of the hardest jobs I’ve had to make something work, but it does! Known for 4 years as ‘Six’ (its folder on my hard-drive) its eventual title comes from the sample of ‘Bill Hicks’, to whom this track is dedicated, which we always used to play at the start. You can hear a bit of psy-trance in this one, as usual without giving in to the genre. This track is very special to me because of the way it came together. Starting from an old reggae bass line of Pierre’s, taken in a dubby direction by me, a jazzy one by Sam and then ska-ed up by Pierre, more than any other track here it’s a total meeting and mixing of personalities. We were oined by Sarah E (responsible for 2 of the mixes on the ‘Passion’ single) on trumpet. The words, sung by Myo and Sam (the first lyrics I’ve written in many a year) were written for my daughter Alia as she turned 18. It’s my personal favourite. Gorgeous sunny vocals from Myo, Irish fiddle riffs, driven by Becky’s marimba, Jon’s congas and some sweet almost airborne bongos from Sean and a groove that shifts from almost housey to almost progressive, with lots of side adventures leaving you, as with much of the album, half-way between dance track and soundtrack. This is the other one that’s been around all along – probably the most up-vibe thing I’ve ever written, and along with Wildflower our most common set-closer. It’s dedicated to 2 of the most positive up-vibe people I’ve known in my life, both of whom sadly passed away in the last couple of years, Brian Visiondanz (who would having been making a video of this for us) and my Nan.